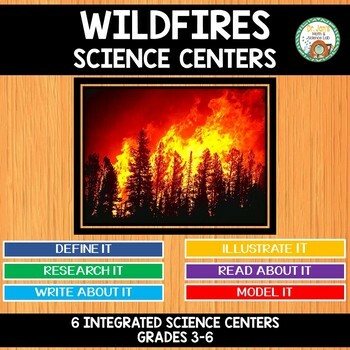 Engage your students in these independent science centers designed to give your students content background on wildfires in a fun and engaging way. 6 centers are included. 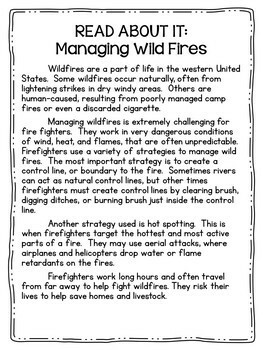 Center 2: Illustrate it: Students will illustrate the growth of a wildfire using a key. Center 3: Research it: Students use some online resources to learn more about wildfires. Center 4: Read About It: Students read a passage about managing wildfires. They then choose questions to answer, and also have the opportunity to write some of their own questions. 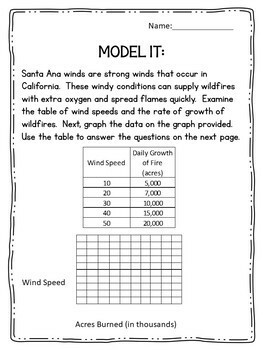 Center 5: Model It: Students use a data table to make a mathematical model of the relationship between wind speed and wildfire growth. They also use the data to answer questions. 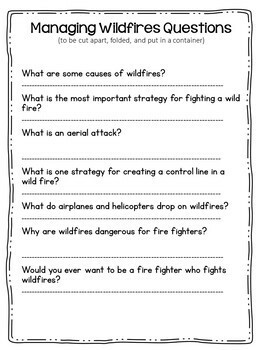 Center 6: Write About It: Students write a descriptive paragraph about an escape from a wildfire.